When counting only customers who switched brands, 33% of Apple’s new customers came from Samsung versus only 11%. Oh, and those Samsung commercials saying Apple is for old people ? Opps.... Guess what ? That was bull$#! @ !!!! Apple customers are younger and make more bank $$$ Cha-CHING !!! 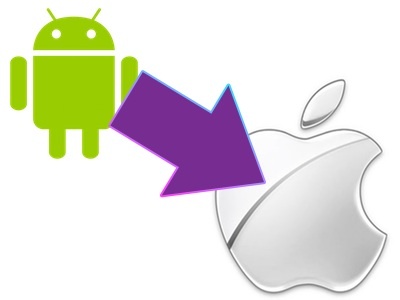 Between July 2012 and June 2013, 20% of Apple's customers came from the Android operating system and 7% of Samsung's new customers during the time period switched from an iOS device, according to a new report from CIRP. When taking into account only customers who switched brands, 33% of Apple’s new customers came from Samsung, while just 11% of Samsung's new customers came from Apple. Samsung attracted more customers from HTC, Motorola, and Nokia, while Apple garnered more BlackBerry users. Both companies attracted former basic phone users, though Samsung attracted a good deal more at 37% vs. Apple's 26%. New phone buyers were more likely to choose a Samsung phone. I bet that some basic phone users moved to Samsung because they have simple needs or thought the phones were cheaper. The study also found that customers who purchased iPhones tended to be younger than those who purchased Samsung phones. 69% of those that bought an iPhone were between the ages of 18 and 34 compared to only 64% of Samsung buyers. Apple buyers had a slightly higher income, with 38% reporting an income over $75,000 compared to 29% of Samsung buyers. 48% of Apple buyers also had a college degree, compared to 32% of Samsung buyers.